Filed under things you might not want to encounter in a hotel: Bane, the masked villain from DC Comics' "Batman" series and "The Dark Knight Rises." At least in a cosplay version, the lumbering giant could very well be there - we'll never know if he's a smiling or stoic greeter - at Buffalo Comicon, which runs Sunday and leads off a decent weekend of events that includes a four-star rock musical, festival dedicated to eating books and a marathon party dedicated to Kanye West. 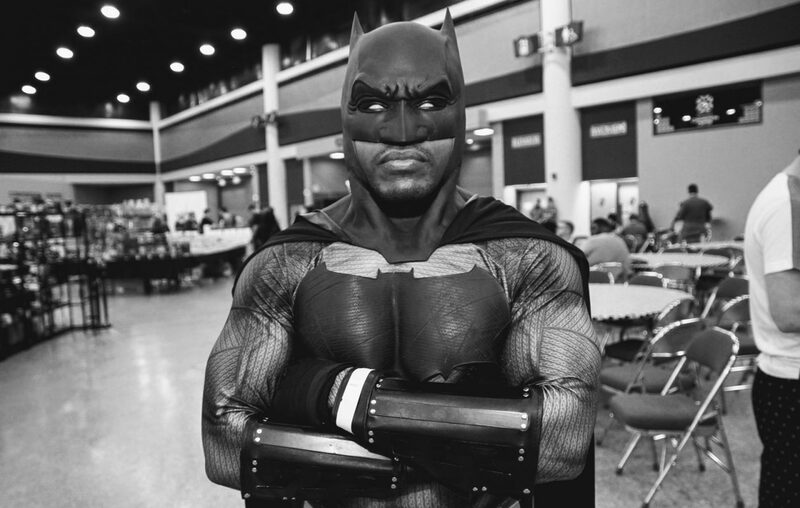 Buffalo Comicon, 10 a.m. to 5 p.m. Sunday, March 31 at Buffalo Niagara Marriott (1340 Millersport Highway, Amherst). Tickets range from $6 to $23 and may be purchased here. Queen City Bookstore and friends invade the Marriott for a day dedicated to nerd and geek culture, comic books, cosplay and the chance to hang out with like-minded fans. For those attending, 1,500 free comic books may be pawed through and brought home, while a Batman coloring contest, cosplay contests for kids and adults, and even a Bane cosplay special guest. You should go if: you either love or think you're Batman. "Rent," 7:30 p.m. Thursday, March 28; 8 p.m. Friday, March 29; 2 and 8 p.m. showings Saturday and Sunday, March 30 and 31. Tickets range from $29 to $77. A rock musical set during the thick of the AIDS epidemic, "Rent" requires a youthful, energized cast for the play, based on the survival, friendships and tragedies experienced by seven artists, to work on stage. News contributing reviewer Anthony Chase says the touring production does just that, with enough historical distance from the AIDS era to give perspective without being jaded. You should go if: you enjoy four-star productions. Buffalo Motorama, 2 to 10 p.m. Friday, March 29, 10 a.m. to 10 p.m. Saturday, March 30 and 10 a.m. to 6 p.m. Sunday, March 31 in Buffalo Niagara Convention Center (153 Franklin St.). Tickets are $15 for one day, $25 for two days or $35 for all three; full details here. The custom car and bike show posts up in the Convention Center all weekend, where celebrities from shows such as "My Classic Car," "Car Fix" and "Chop Cut Rebuild" will sign autographs and pose for pictures (this may include a fee). Orange County Choppers and California Dreamin' Hot Rods, from Tonawanda, are two of the major builders with a presence at the event, which will also feature live music and Star Wars cosplay characters. Look back at Smiles from last year's Motorama. You should go if: you're hopelessly addicted to car shows on TV. Edible Book Festival, 3 to 6 p.m. Saturday, March 30 in WNY Book Arts Center (468 Washington St.). Cost is $8 for non-members, $5 for members, and each registration receives two free admissions. Edible books should be delivered between noon and 2:30 p.m. March 30. The Western New York Book Arts Center takes part in the International Edible Book Day with its creative, sweet shindig that pairs literary love with baking. Guests can submit a dessert - typically a cake, cupcake or cookie - that most resembles a book. Registration may be done here. Attendees also serve as judges for categories such as Most Book-Like, Best Tasting, Funniest and Punniest, Best Presentation and People's Favorite. Look back at Smiles from 2018 and 2017 to see the witty desserts, which get eaten, too. You should go if: you like to eat either fiction or non-fiction. All-Night Kanye Party, Part II, doors at 8 p.m., show at 9 on Saturday, March 30 in Buffalo Iron Works (49 Illinois St.). Cost is $10 in advance or $15 at the door. Can you handle a whole night of Kanye? DJ WeJoe2.0 will spin Yeezus in Iron Works, and guests are encouraged to dress in Kanye or Kardashian fashion, which means you can scroll through Kendall Jenner's Instagram or shine your Adidas Yeezy Boosts for a practical cause. The dance party at the 2017 All Night Kanye Party looked epic, so whether you've been a fan since "The College Dropout" or just latched on since Kim Kardashian started dating him in 2012, Saturday promises to be a good time. You should go if: you have kept up with the Kardashians, and trust us, that's not easy. A Taste of Jazz, 4 to 8 p.m. Sunday, March 31 at Brickyard Brewing (436 Center St., Lewiston). Cost is $20 in advance or $25 at the door. From booking in-demand bands, securing permits and promoting the event, organizing a free music festival is no easy - or cheap - feat. The 17th annual Northwest Jazz Festival, which runs Aug. 23-24 in Lewiston, will host a fundraiser in Brickyard, the village's pub-restaurant-brewery. Carolyn Lansom and Dozo My Lady and My Cousin Toné will handle the entertainment, with several talented vocalists accompanying the latter, an eight-piece jazz ensemble. Food donated by local restaurants, as well as silent auctions and raffles, will be additional activities. You should go if: you know the difference between a tenor saxophone and a baritone saxophone. Springtime in the Country, 4 to 9 p.m. Friday, March 29; 10 a.m. to 5 p.m. Saturday, March 30; 10 a.m. to 4 p.m. Sunday, March 31 in Event Center at the Hamburg Fairgrounds (5820 South Park Ave., Hamburg). Cost is $6 in advance, or $8 at the door for adults and allows for a return visit. Children 12 years old and younger get in for free. Two hundred artisans from across the country converge upon Hamburg for a spring festival, which boasts a staggering array of products. New for the 25th anniversary of the event is a spring market, which will offer fresh fruits and vegetables, fresh flowers and the fruits of the labors of brewers, distillers and wine-makers. Find the list of participating artisans here. You should go if: Spring is your thing. The Trews, doors at 7 p.m. Friday, March 29 in Town Ballroom (681 Main St.). Cost is $22 in advance or $25 at the door. Touring off "Civilianaires," the Trews' sixth studio album, the Nova Scotia rockers are not strangers to Buffalo, playing roughly once a year over the past decade. In an interview with the Kelowna Capital News, lead guitarist John-Angus MacDonald discusses how he avoids complacency in his art, as well as his production for up-and-coming bands such as the Glorious Sons. You should go if: you adore Canadian rock, or you named your child Angus. Plates and Pasta, 7 to 10 p.m. Saturday, March 30 in Buffalo Arts Studio in Tri-Main Center (2495 Main St., Suite 500). Cost is $75 in advance. Support Buffalo Arts Studio's endeavors on Saturday with the fancy Plates and Pasta, for which roughly 100 local artists have decorated ceramic plates or pasta bowls. Each attendee will choose a special dish to keep after participating in several stations, some dedicated to sweet and savory foods, drinks, music, art studios and an auction. You should go if: you want to munch on your pasta with a touch of local sophistication. Steve Rannazzisi, 7:30 and 10 p.m. Friday and Saturday, March 29 and 30 in Helium Comedy Club (30 Mississippi St.). Cost is $21 for general admission, $29 for reserved seating. We teased Rannazzisi's Thursday performance in This Week in Buffalo, but his busiest time here runs Friday and Saturday. The commissioner on "The League" (FXX) and a star on two Comedy Central specials, Rannazzisi will spend Major League Baseball's first weekend of games here. A devout Yankees fan, expect some baseball humor sprinkled in his sets. You should go if: you own an Aaron Judge jersey or enjoy a hearty chuckle. BONUS: Souped Up 3, 3 to 6 p.m. Saturday, March 30 in EXPO Market (617 Main St.). Free to attend, while soups are $2 per 4-ounce bowl. See the list of soups here, and Smiles from the 2017 Souped Up here. Sold out: Sweet Tooth Festival, at the Hotel @ the Lafayette, on Sunday.